Nestled in the beautiful Smoky Mountains, Gatlinburg’s romantic and beautiful outdoor scenery is perfect both for honeymoons and weddings. Hundreds of couples take their oaths in Gatlinburg each year, both in casual and formal settings. Indeed, the Smoky Mountains are such a popular wedding location that they have been dubbed as the wedding and honeymoon capital of the South. Couples typically choose to get married in either the Great Smoky Mountains National park, in a Gatlinburg wedding chapel, or in their own romantic Gatlinburg cabin. 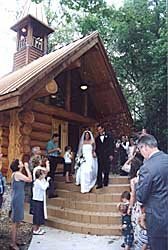 A private cabin wedding allows for a more customized and casual event. In addition, if guests, food, and photographers are minimized, such weddings are also highly economical. The cost of a minister for such a ceremony can cost as little as $99. Each year many sweethearts enjoy this thrill of a lifetime – a private wedding in their own romantic Gatlinburg cabin, complete with a hot tub, fireplace and stunning mountain views. In addition, several nearby attractions – such as Dollywood and Ripley’s Aquarium – make Gatlinburg an ideal place for an extended stay before and after the wedding. Whether the wedding party is just two sweethearts or a larger group of guests, Gatlinburg is an ideal vacation spot that combines romance with the rustic outdoors, as well as many opportunities for shopping, dining, and more. An unforgettable wedding experience awaits you, with wedding staff in Gatlinburg anxious to manage all of the details – from the photographer, minister, and lodging to the beauty make-over. Several wedding chapels and wedding service providers exist online to assist you with the entire planning process and the actual event.